Simple, saucy and oh-so-tasty! Store the beef in the freezer to make it more tender. Just before cooking, defrost the meat. 1. Cut the beef fillet into thin slices. Season with cornstarch and sugar and set aside for 5 minutes. 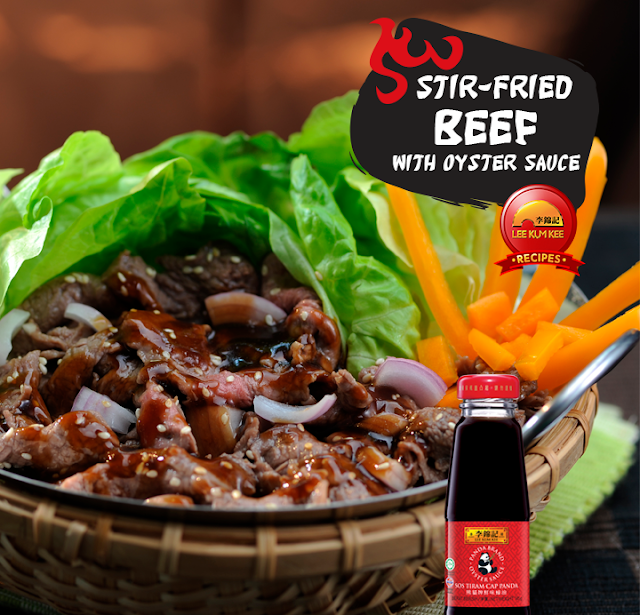 Then add 3 tbsp Panda Brand Oyster Sauce and toss well. 2. Rinse the lettuce and let it drain. Arrange in a serving plate. 3. Roast the sesame seeds until golden brown and let it cool. Set aside. 4. Saute the garlic with a little oil until fragrant. Add in the onion and stir. Add the beef and stir fry at high heat while tossing briskly. When the beef is half done, turn the fire off. 5. Arrange the beef in a serving plate and sprinkle with sesame seeds.